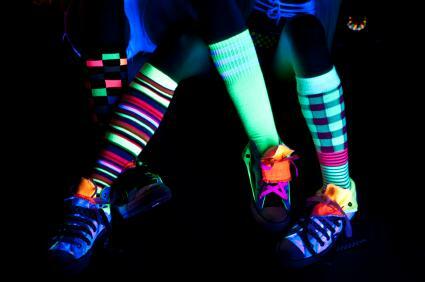 Dance away at a black light rave! Partygoers who enjoy the pulsing techno music of a rave party will love black light decorations that enhance their experience. Keep your house clean by decorating your backyard for this exciting party. The crucial element of any black light party is the lighting. This means that any black light rave will need to be hosted at night to make the black light effects obvious to dancers and onlookers. Make sure your outdoor party lights are appropriate for this type of party. The first thing you should do to get your party area ready is to swap out all traditional outdoor light bulbs with black light bulbs. Remember to swap the porch lights, outdoor lamps, and any overhead lighting on patio rooftops. Light bars and panels are both available from HouseOfRave.com. Lighting ropes and strings are easy to hang and add ambiance to the party. For a truly awesome effect, set up a bubble machine pointed at the rave dance floor. Pour in Bewild.com's Tekno Bubbles and your dance floor will be a stunning sight. Create a unique guestbook by propping a large sheet of plywood in a corner of the backyard. Hang a black light bar above the plywood or set a small panel below it. Set out black light paints and paintbrushes and allow guests to sign their names, write messages and draw pictures on the plywood. The guest book becomes part of the décor. Don't forget that partygoers themselves can be part of the decorations. On your party invitations, indicate that people should wear white or light colored clothing. Hand out glow sticks and necklaces to guests as they arrive. Set up a black light face painting area and allow guests to decorate themselves with reactive body paint. Find what you're looking for in body paint, facial dust and lip gloss at Be Wild. Strobe lighting is perfect when the rave music is really pumping. Set the strobes so they pulsate with the beat of the songs. Fog machines add great ambiance in the backyard while allowing the glowing haze to disperse without bothering anyone. If you have trees and bushes, look for glow in the dark stars to hang from them. They'll look light they're part of the black light decorations, and you won't have to worry about aiming a light at them. Glowsource offers novelty items perfect for any party. Check out their LED vine lights, glow sticks and light up ballons to add to your party fun. Gadgets and Gear sells a gamut of items from submersible floralytes to fiber optic lights to beacons and plasma balls. A backyard rave party featuring black lights makes an exciting party theme for adults and teenagers alike. Even kids can get into the fun with face painting and dancing. With enough black lighting, all of your reactive decorations will stand out in the dark night.